Spray insecticide highly effective and fast acting and residual. Power, because it has a JET POWERFUL LONG UNTIL 6 M. due to its special VALVE "JET" and a particularly powerful propeller (unique in the market) that allows you to act securely. A real destroyer of Wasps, hornets and their nests also important dimensions. It also kills insects returning to the nest after treatment, it suppresses larvae, eggs and pupae, leading to total exhaustion the Treaty nest. Emptying time of about 1 minute. ALSO USED BY THE FIRE MAN! Notes: the special VALVE "JET", making the long and powerful jet, allows to operate in complete safety even in extreme conditions. This also eliminates the nests placed inhard to reach places. 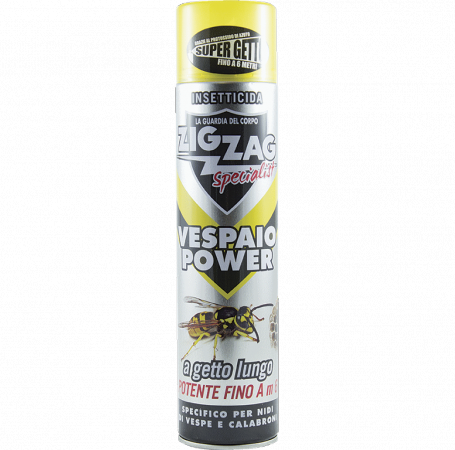 Against Vespas and Calabrian use as a normal insecticide. Against nests, nebulize from a safety distance of at least 4 meters at short intervals, directing the jet directly to the targets (nests of wasps, spiders, horns, bugs ...). The ideal is to work in the early morning or late evening when the wasps are dormant inside the nest.